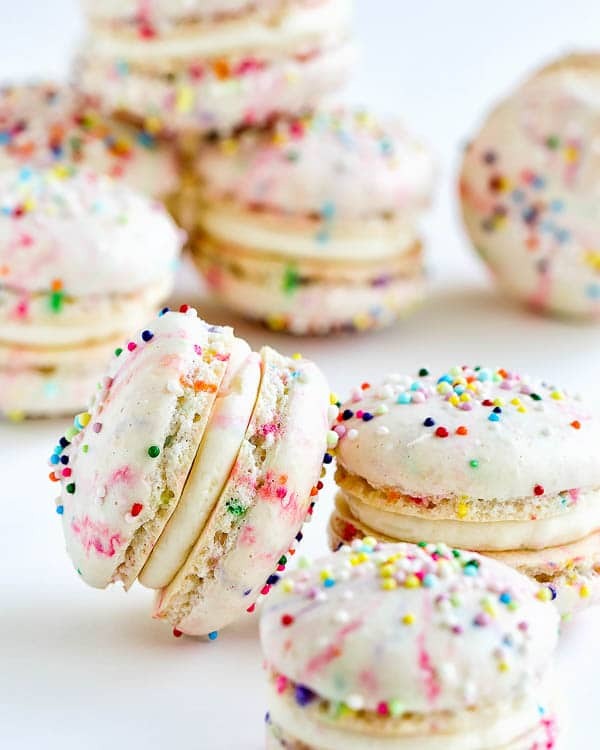 Fun and festive funfetti macarons to celebrate any special occasion. My full video tutorial will walk you through the entire process. 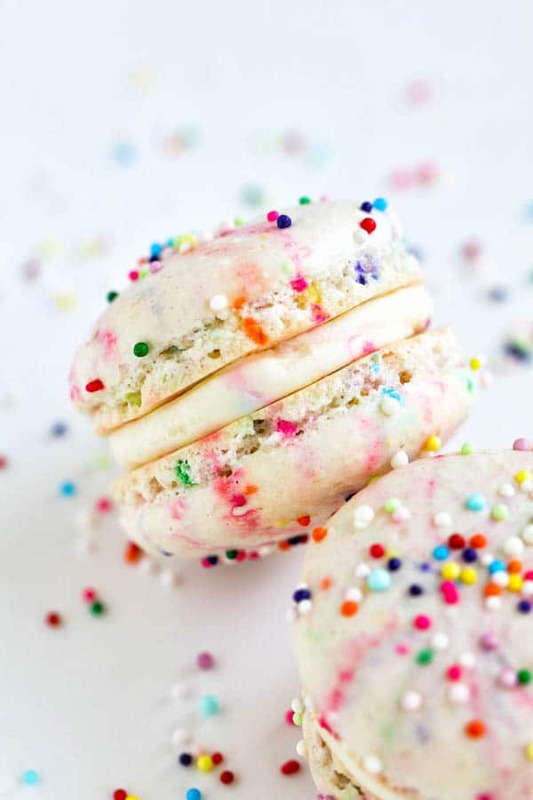 I’m following up on my gigantic French Macaron 101 post from earlier this week with these festive funfetti macarons with a FULL video tutorial. Whaaat? Yes, now you can watch exactly how I make my macarons and follow along. Also, make sure to check out my super detailed french macaron 101, where you’ll find ton of tips on each essential part of macaron making process, from making meringue to macaronage technique. Not only that, I’ve also included a visual infographic to troubleshoot the most common problems, many of us face when we make macarons. My hope is that with all these tips, my troubleshooting guide and this video tutorial, you’ll be enjoying your very own perfect macarons. 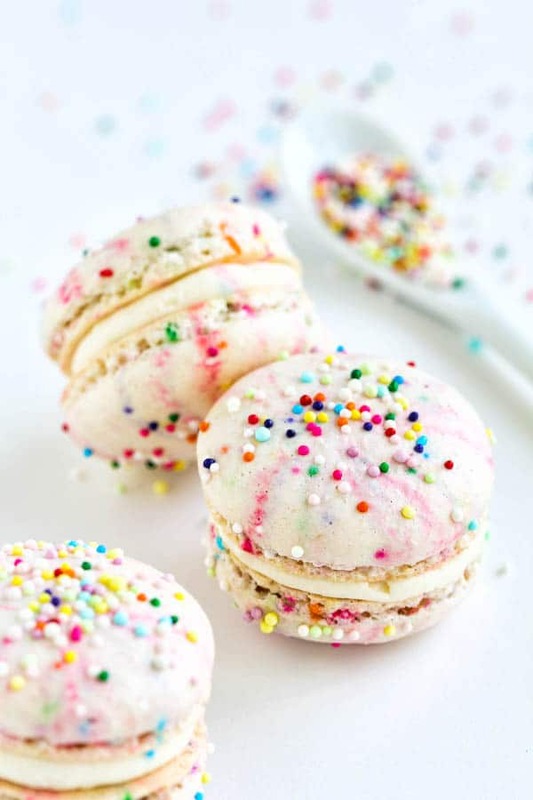 Now find CREATE an occasion to make these beautiful funfetti macarons! And don’t forget to send me a picture. I love seeing your creations! In a medium bowl, sift together almond flour and powdered sugar twice. Set aside. In a large mixing bowl with whisk attachment, beat the egg whites on medium speed until foamy. Add cream of tartar and continue to beat. Slowly add sugar one tablespoon at a time. Increase the speed to medium high and beat until hard peaks. Add vanilla extract and beat on medium speed until combined. Sift the almond flour/powdered sugar mixture over the whipped egg whites. Gently fold the mixture running the spatula clockwise from the bottom, up around the sides and cut the batter in half, as shown in the video above. The batter will look very thick at first, but it will get thinner as you fold. Be careful not to over mix it though. Every so often test the batter to see if it reached the right consistency. To test the batter, drop a small amount of the batter and count to ten. If the edges of the ribbon are dissolved within ten seconds, then the batter is ready. I repeat, do NOT mix again. If you still see edges, fold the batter couple more times and test again. This step is so crucial, so please make sure to test often to ensure not to over mix the batter. Add the sprinkles (as much as you want) and carefully stir the batter to distribute the sprinkles evenly. Be careful not to over-mix as sprinkles will bleed its color into the batter too much. Tap the baking sheets firmly on the counter a few times to get rid of any air bubbles. If you don’t release the air bubbles, they will expand during baking and crack the beautiful macarons shells. And who wants cracked macarons, right? Sprinkle some more sprinkles on top. Let the macarons rest and dry for 15-30 minutes. On a humid day, it may take an hour or so. To see if it’s ready to be baked, lightly touch it. If the batter doesn’t stick to your finger, then it’s ready. Bake the macarons for 18-20 minutes. To check the doneness, carefully remove one macaron. If the bottom does not stick, they are done. While macarons are drying, prepare the buttercream. In a mixing bowl with whisk attachment, beat the butter and powdered sugar until fluffy, about 2 minutes. Add the melted white chocolate and vanilla extract to the whipped butter mixture. Beat until the filling is smooth and well combined. Stir in sprinkles. Transfer the buttercream into a pastry bag and fill the macarons. For additional tips and visual troubleshooting guide, check out this post. This recipe was originally published on December 23rd, 2015. Hello Shinee, These are beautiful and your video was perfect to show the stiff peaks for the egg whites and the ‘lava’ consistency for the final batter. While I used your video, I used a different recipe. I would love to try yours as yours has much less sugar than the other recipe and I am trying to cut down on the sweetness of the overall cookie. Do you think that your recipe does tend to be less sweet compared to some others that are out there? The one I used was90 g almond meal or almond flour175 g powdered sugar45 g granulated sugar3 egg whitesI notice that some use 2 egg whites and others 3 egg whites and wondered what the difference is. Thanks so much for the amazing video and taking time to answer my questions. Thank you, Jamie. Glad the video was helpful. Yes, mine definitely less sweet, but in my opinion, they’re still plenty sweet especially with the filling and everything. When I try other macaron recipes with higher sugar content, they come out not only sweet but the texture is much crisper and more meringue-cookie-like. 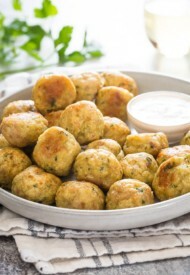 I’d love to hear your feedback if you try my recipe. Thanks!! I will definitely try your recipe and let you know how it compares to the sweeter ones I’ve made, which are wonderful but still too sweet. I look forward to trying yours. Thank you so much for getting back to me. After 2 failed batches yesterday with a different recipe, I gave yours a go and SUCCESS!!! I don’t have as fully formed, tall feet as yours, but I’m thrilled that I’m headed in the right direction. Thank you for sharing your recipe! Yay, so glad to hear you had better success with my recipe. Thank you for your feedback, Chrisi. Amazing! So happy you’re impressing your friends with your macarons, Amy! Thank you so much for your feedback. It means so much! 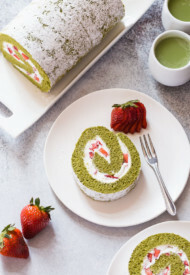 I am trying to make these but, the one thing I don’t understand why you cut the batter? Hi, Gracie. I’m not sure I understand the question. What do you mean by “cut the batter”? Do you mean the folding technique? Yay, so happy to hear this, Cora. Thank you for your feedback! 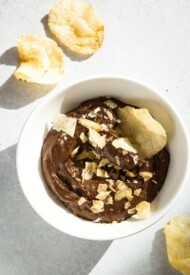 This recipe is awesome and the base recipe now for my macarons! So happy you loved my macaron recipe, Jolianne! Thank you for your feedback! Love this recipe. This was the first time I made Macarons and I started with this recipe because it looked like the easiest. They came out great, I then made the strawberry ones and I’m about to make the pistachio ones. The only thing is that I was unable to get two trays. Only one. They came out about the same size in the picture and seemed to be the same consistency. Any suggestions? Wow, Lisa, love that you’re making so many macarons. Are they just fun?? Can you tell me how big are your cooked macarons? Mine are about 1.5-inch rounds cooked shells. Thanks for getting back to me. Yes, I loved making them.I would say they are roughly 1.5 inch because I get 24 on a baking sheet. I made three kinds and they all came out the same. Great I might add, but just not two sheets worth. Can I double the batch or do I need to make batches separately. Interesting! I always get 1 full pan and 2nd sheet is half. No idea why you would get less batter. I’ve never tried doubling the recipe in fear of failing. It may work out, but I think the last ones that go into oven will be too dry and may get funny, bulging feet, because I recommend baking 1 sheet at a time. I’m trying to sift the almond flour, but it’s not that easy. A good bit is in the bowl, but there’s probably at least 1/2 cup still left in the sifter. Do I keep sifting it? Yes, keep sifting. Or you can put what’s left in food processor to process for a minute or two and try sifting again. You want no more than 2 tablespoons leftovers to toss. Hope this helps, Cassie. Let me know. Thank you so much for all of your posts on macarons! As a newbie it was incredibly helpful. I have had great luck making two batches now with successful feet! Hi Kaitlin! So happy to hear about your macaron successes! Please share a photo next time. 🙂 And thank you for your feedback! I’ve been wanting to make macarons for so long but haven’t because I always thought they were so difficult but your wonderfully detailed instructions made it so easy!!! So easy that I made both the funfetti and the lemon flavors this weekend. I want to make a double batch next time, do you have any tips for doing a double batch? Hi, Jessica! I’m so happy you made these!! It’s not that hard, isn’t it? 🙂 I’ve never doubled the recipe, but if you do, it might take longer to fold the batter to the right consistency. Also, when you transfer the batter into a piping bag, do it in 2 batches. Because when you squeeze the batter in the piping bag, the consistency change a bit (gets runnier). Hope this helps, let me know how it goes. Thanks so much for stopping by and leaving your feedback! Hi! Those are beutiful macarons!! I am sorry but I don’t understand why the weight is the same for almond flour and powder sugar if they are 3/4 cup and 1 cup. Hi, Neribeth. Dry ingredients vary in weight due to its density, even if they are the same volume-wise. Hope this helps. Would these be able to be frozen for 2 weeks? I want to make these for my graduation party! Hi, Anna. Yes, you can freeze these macarons. I did freeze some of my test batches and it was just fine. Congrats on your graduation and hope you enjoy the macarons! Awesome, so glad to hear your first try was a success! Thanks for sharing your feedback, Hannah! These are beyond fun! 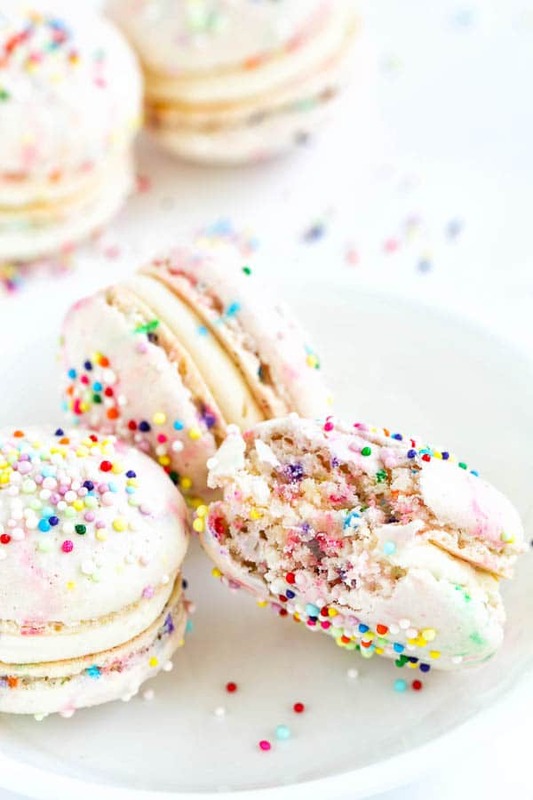 Love funfetti anything, but especially macarons! These are beautiful, and adorable, little cookies…I’m torn between whether or not I would actually eat them, because they are truly a piece of art. Thank you for sharing! These look so delicious and your photos are absolutely beautiful!! These are the most adorable things I’ve ever seen! They actually make me want to attempt macarons again! Thank you, Brianne! Definitely give them another try. How cute are those?! What a fun idea! 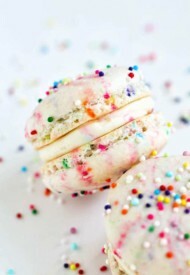 These are the perfect funfetti macarons, Shinee! Happy New Year! I’ve actually made funfetti macarons before but they didn’t turn out nearly as pretty. Granted, it was my first attempt ever at making them so I need to give them another shot.